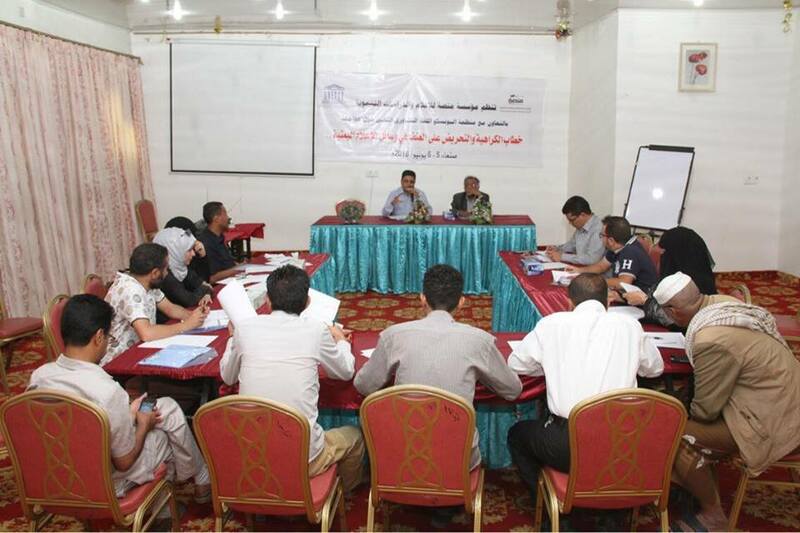 Sanaa, June 5- In cooperation with UNESCO and the International Programme for Development of Communication (IPDC), Mansa Foundation for Media and Development Studies held on Tuesday the second consultative meeting as part of countering hate speech in the Yemeni media project. Abdulbari Taher, the former head of Yemeni Journalists' Syndicate, said the most dangerous thing from which we are suffering today is the creation of a culture of hatred and violence in the community and the instilling animosity and strife among individuals and groups, and the media is chiefly responsible for such a culture. He emphasized the the importance of holding such consultative meetings which aim to alleviate the sharpness of media discourse and seek to restore the main function of media which is enlightenment and presenting the truth to the public. Taher expressed his appreciation for the efforts exerted by Mansa Foundation and UNESCO to implement this project in spite of the difficult circumstances Yemen is undergoing, adding that such circumstances entail the consolidation of peace, tolerance and coexistence values. Adel Abdulmughni, the project manager, commended the positive interaction and participation of the media leaders over the first phase of the project which intends to rationalize the media speech and distance the media from the seditious and inflammatory words in this intolerable situation. Abdulmughni presented a brief overview of the previous Aden consultative meeting which was held in the attendance of media leaders there. He pointed out that there is a real desire among all media leaders to confront the discourse of hatred and violence, a discourse which has created a negative culture in the media and then transforming to the society as a whole. Abdulmughni said the second monitoring report, which was prepared by Mansa Foundation, included 15 different Yemeni media outlets and revealed a relative decline of hate speech compared to the first monitoring report. According to Abdulmughni , this is a positive indicator that calls for more efforts and intensification of programs and activities in order to avoid the serious repercussions of hate discourse and violence incitement. At the meeting, participants finalized the discussion of the hate speech lexicon and the declaration draft which includes media-related professional and ethical standards. The participants praised the contents of the project, saying the project was reflected positively on their media discourse and that they will strive to abandon the seditious and divisive language in their media outlets .